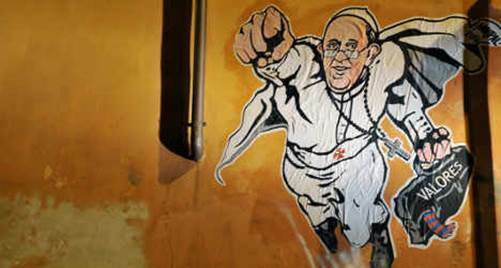 Well, I am happy to say that I have come to see the day that I can lay claim to an authentic “superhero.” Pope Francis has made his way to that legendary category today as is seen by this image of him displayed on the busy Borgo Pio just outside the walls of Vatican City. Having one’s hero depicted in this way is not too strange, especially when you see all the pop culture depictions of our Holy Father from Time magazine to the latest (dubious distinction) onRolling Stone magazine. A “superhero” is someone who protects and defends truth and justice and basic human freedom. Armed with the virtues and the values of the Gospel, the Pope takes on the basic and evil elements that imprison and deceive minds and hearts and souls in our daily lives. As the Vicar of Christ on earth, we expect him to fight for truth and achieve Gospel values with the power of Jesus Himself. I doubt he can fly, but I would not deny that he is a challenge to complacency and certainly a foil to the enemies of the Gospel! Long live the Pope! Pray with him and for him at Sunday Mass. This entry was posted in Uncategorized on January 30, 2014 by dioceseoflacrosse. Once again, we set aside time to reflect on the great blessing we have in our Catholic Schools. In our Diocese, nearly 12,000 students learn how Faith, Knowledge, and Service are integral to their education and provide balance for their future. This week, together with so many people across the United States, I proudly celebrate Catholic Schools. This past Saturday night was our diocesan “kick-off” event as I celebrated the Mass at our Cathedral concluding the annual Brains and Braun Tournament. The Cathedral was nearly full of students, their families, and school leadership from across the Diocese as they received their awards for participation in the tournament. Thanks to everyone who took part in the tournament and the Mass—the heart of our Catholic faith. As we take time to celebrate our schools, I’m under the impression that there still remains such an agonizing misunderstanding about Catholic schools. My sense is that some of us view Catholic schools through a prism of nostalgic traditions and pious stories with priests and Religious sisters who have faded into our corporate memory. For those who do not view them in such a way, we may find those who consider Catholic schools as no longer part of the essential mission of the Church. Some “bottom-liners” find them utterly irrelevant and ultimately cost prohibitive in a world of “free” tuition and widely available public education. I think this misinterpretation is the nub of the problem. Somewhere between the “pious memory,” the contemporary cost consideration, and their irrelevance to our secular and relativistic mind-set, Catholic schools have lost their identity—not on their own—but because we have failed to recognize their purpose and necessity as part of Catholic evangelization. This year marks the 40th anniversary of Catholic Schools’ Week. The annual event began at a time when the nostalgic view was being born with everyone looking back to the way our schools were. It was necessary to understand how the schools were at that time and to look forward to the future and imagine the way our schools could be. The loss of legions of Religious Sisters’ communities who faithfully held the national Catholic school system together dealt an irrevocable blow to schools’ operations, their success, and ultimately, their identity. In 1974, we started to take note of what we were doing to rebuild and rebrand Catholic schools with lay faculties and staffs. The expenses mounted as the Church started to comprehend the true cost of running the schools; the true value and sacrifice of the noble Religious who ran them in a different age also became much more evident, as well. We have seen much over these 40 years. There are 6600 Catholic schools across the country. In the Diocese of La Crosse we proudly boast 7 high schools with a combined enrollment of 1,565 students; our 63 elementary schools educate 7,138 young people. Viterbo University, the fine Catholic and Franciscan institution that makes its home in La Crosse, has an enrollment of 3,000 students. Catholic schools continue to excel with a 99% graduation rate and 85% of our secondary graduates move on to colleges and universities. Leadership and scholarship continue to serve as the mainstay of the Catholic academic tradition. The driving force of the entire effort is faith in Jesus Christ and the communication of His mission in the world. This is the heart of Catholic identity and without it no Catholic institution can exist. I am proud of the Catholic Schools of this Diocese and I work hard to maintain them. I know that criticisms abound for a lack of Catholic identity and visible recognition and understanding of the faith. We are working hard to make that essential value a visible reality with our students. Please do not forget—we live in a hard and secular world. Educating children along a moral and intellectual path is not an easy thing. You must not think that we can do this alone—without you. Whether you are a parent with children in school, a grandparent who “put in your time,” a single person with “no connection” to a school—you are essential to the effort. Catholic schools are a community effort—it’s the work of the Church to ensure the future. You’ve got to be involved in that! Catholic Schools, with Faith, Knowledge, and Service, are preparing the next generation of Catholics. Thanks to our parents, pastors, administrators, teachers, staffs, and to all the VOLUNTEERS who make our schools work. Pray for all those involved in the work of educating our young people in the faith. Catholic schools—learning to live the values celebrated at Sunday Mass. This entry was posted in Uncategorized on January 28, 2014 by dioceseoflacrosse. A while ago I spoke concerning the truth and the integrity of Pope Paul VI’s great encyclical letter, Humanae Vitae. I said that it was one of the most prophetic and true papal documents ever written. Believe it or not, I received several letters in response to that statement from all over the country. Some very intelligent people told me that I was truly out of my mind and I should recognize that “we are beyond that” and “nobody believed that stuff then, and even fewer believe it now.” Well, I guess I never claimed to be all that “current” and “progressive” and all, so I continue to speak and write about it because it matters—and must be made part of our discussions, because as Catholics we seem to have become desensitized surrounding the issues of contraception and abortion (AKA “birth control,” or “women’s health care”). In 1968—what a year—I graduated from high school and Pope Paul VI issued Humanae Vitae. It was surprising for me to see how many priests and sisters did not support the encyclical and were eagerly trashing the Pope who wrote it! Yes, that was quite a hot summer—1968. As I later began to study theology in the seminary, I discovered the central facts—predictions—prophecies—of the encyclical and their impact upon society. Lastly—a false sense of autonomy. The encyclical acknowledges that “perhaps not everyone will easily accept this particular teaching.” The Pope, however, goes on to point out that “Since the Church did not make either of these laws, she cannot be their arbiter—only their guardian and interpreter.” The Church cannot “declare lawful what is in fact unlawful.” The encyclical closes with an appeal to public authorities to oppose laws that undermine the natural moral law, an appeal to scientists to further study effective natural methods of family planning, and appeals to doctors, nurses, and priests, to actively promote those methods. Five years later on 22 January 1973, the Supreme Court ruled favorably in the case of Roe vs. Wade. The world has never been the same. A sad commentary on our time, based on that little chapter of history, is how the Church now finds Herself engaged in a battle to safeguard religious liberty and individual conscience protection in the matter of the mandatory inclusion of contraceptives, abortifacients, and other medical procedures in the Affordable Care Act and reform of healthcare for our country. Currently, the battle seems to focus its attention on the Little Sisters of the Poor, an outstanding community of consecrated Religious women whose only mission is to care for the elderly poor. They fulfill their mission with the zeal and compassion of Christ Himself. My mother died with ten Little Sisters surrounding her bed praying for her and consoling her in those last moments. I am very fond of these Sisters. Now, however, they are being coerced into accepting the very things that the Pope so clearly condemned in 1968 as they are told they must participate in “health care reform” or face fines and penalties. If they provide health care coverage that does not include contraceptives, including abortion-causing drugs and sterilization, the fines they face will close down their homes and force the elderly poor people they care for into the far less reputable care of others. Like St. Thomas More, who opposed Henry VIII in 1535, all they have to do is “sign the paper” and let others give and pay for the contraceptives, abortifacients, and other “critically needed” health care procedures. Thomas More was executed rather than sign the oath that would make Henry the leader of the Church. We, however, have a tried and true weapon to fight tyranny and despotism, the Constitution of the United States. It protects us and our individual consciences from laws that usurp the practice of our religious freedom. Compassion and sensitivity are necessary when approaching the issues at hand; there is no doubt. Once again, however, knowledge of our faith and appreciation of our teachings is so important for us. If we don’t reclaim the heritage of our faith and the correct vision for our livesHumanae Vitae gives us, others will take that ideal from us and ultimately use it against us—and sadly, we will not even see it coming. The virtue of courage is necessary for us to conquer fear and the gift of faith is life in Christ. As Chesterton once said: “The man who stands for nothing, will fall for anything.” Please review and study your faith. Read the Catechism and especially study the teachings of our most recent popes—they have indeed been gifts to our generation. Our presence at Sunday Mass sure helps! This entry was posted in Uncategorized on January 15, 2014 by dioceseoflacrosse. Jesus made it very clear that John the Baptist was not some sideshow barker who was out to trade on the latest Messiah craze. He, the Baptist, did not come to announce a new way for people to abandon the faith of their elders, but rather he showed the way for people to realize the strength of their faith and the traditions that they are promised throughout the Scriptures. Most people were surprised by the Baptist and by his message and by his means of delivering it. It was discomforting. It was preparing the way for Jesus. There is currently a great curiosity concerning Pope Francis. He does have a way of saying things that are often perceived in a provocative and a less nuanced manner than any pope many of us have ever known in our personal histories. A voracious media, hungry for what it sees as ultimate change in the Catholic Church, has magnified the Pope in such a way that would “turn the head” of a lesser man. This Pope is the Vicar of Christ and the Successor of Peter, and he knows it. It was to Peter that Jesus, Himself, gave the keys of the kingdom—the power to bind and loose, and this Pope knows that as well. A resolution for the future: celebrating the faith at Sunday Mass. This entry was posted in Uncategorized on January 6, 2014 by dioceseoflacrosse.